Insurance and a league so closely tied to alcohol might seem like a strange mix, but business is business. QBE has signed a sponsorship with Premier Rugby (Guinness Premiership) in an effort to raise the firm's profile across Europe. The agreement, which starts immediately and runs through to the end of July 2012, will see QBE's name and logo appear on the 12 Guinness Premiership clubs' shirts in all competitions including the Guinness Premiership, European competitions and the Anglo Welsh Cup. One quick way to raise the firm's profile? 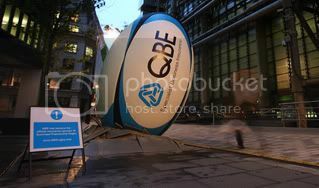 Unleash a 4 meter high branded rugby ball next to your business partner's headquarters. According to Broking.co.uk, this is the first time that a brand had secured space at One Lime Street next to the Lloyd's building, home of the insurance institution Lloyd's of London. Steven Burns, CEO QBE European Operations, commented: "This is a fantastic partnership for QBE. We are excited to be working with Premier Rugby and proud to be a partner of the most successful rugby union league in the world. As official insurance partner, QBE will be looking to significantly increase its brand awareness across the UK. "Despite being one of the world's leading insurers, QBE has a low profile in the UK outside the London insurance markets. We have ambitious growth targets and see many opportunities to continue expanding our business, particularly across Europe. This sponsorship will drive an increase in brand awareness in the UK and will provide us with a number of business development opportunities," Burns said. QBE Insurance Group is one of the world's largest international insurers, headquartered in Sydney, Australia. It operates out of 45 countries across the globe, doing business in over 100. QBE has been active in the UK since 1904, originally within the marine insurance market in London, but has grown substantially in the last 10 years to offer specialist commercial insurance to companies across the UK. At the end of 2008, the Group's UK turnover was approximately £3bn, making it one of the largest insurance firms in the UK. Jon Varney, Commercial Director of Premier Rugby, added: "We are delighted with this partnership and feel there is a strong strategic fit between the two organisations. Like QBE, we are growing rapidly, with attendances more than doubling since the league began in 1997. It is an exciting time for Premiership Rugby and we look forward to working with QBE."